My Sunday sewing classes stretched from 3 hours into 5. I didn’t watch the time. One father showed up and was dismayed to find his daughter still at the machine and not packed up ready to go. I am not scheduled to teach next Sunday but told everyone I will come in and do a freebee class. Not much can get accomplished in just one hour a week. During the class today one of the new students brought in her mom’s old sewing machine. She had taken it all apart because it wasn’t sewing. 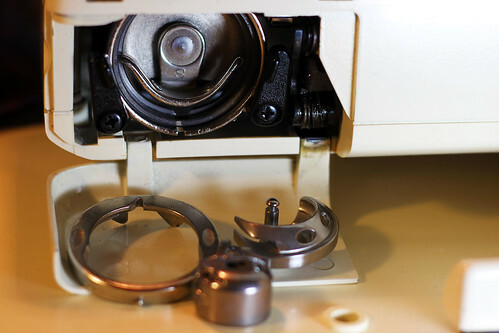 For those familiar with sewing machines she had been using the bobbin winder as the spool pin. That is why it wouldn’t sew. Though it was the first time I had seen the brand or some of the parts, I just knew how it went back together. The machine is a very early zig-zag machine. It sews fine, except the straight stitch isn’t as straight as I would like it to be. It is a good feeling knowing I can and have always been able to fix mechanical machines. Maybe that is why I like to sew. I really like sewing machines. I didn’t bring my camera to class so I undid the shuttle assembly on my Kenmore. The old machine I fixed today had a few more parts and they were harder to get too, but you can get some idea of the area that was taken apart. This entry was posted on Monday, August 24th, 2009 at 3:00 am and is filed under Sewing. Tagged: Sewing. You can feed this entry. You can leave a response, or trackback from your own site. I need to learn more about my machines and how to take care of them. How generous of you to offer a freebie class! It’s good when you can take care of those things yourself. My machine stopped sewing in reverse while I was making the bridesmaids’ dresses. So I had to reduce the stitch length at beginning and end of the stitching. But I don’t have a clue what could be wrong there–a belt that needs replacing or a transmission problem. It needs a good tune-up and thorough cleaning anyways, so I’ll take it in tomorrow.